Hi everyone, I hope you are having a great weekend! The weather here is not all that well but I had a good rest since two days and not I started feeling better. Today we have an appointment with the gym to see if we get membership. After struggling so long to find time for sports, now I am determined to make it. It looks like a bit stupid to start it right now, right before the start of the lectures next week but I am a believer of "all changes at once" to make it work. It is tough but doable. I will then see what works with the blog. On the worst case I blog a little bit about fitness too, what do you think? I was anyway giving it some thought to bring some fashion in here and there. 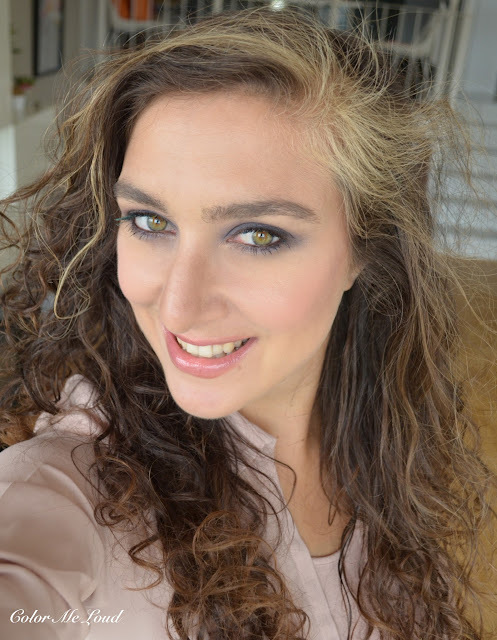 Do you like blogs with broader scope or prefer make-up only ones? Today I have a new liquid lipstick release from Estée Lauder who vamped up their entire line lately, in a good way and their lipsticks became "the thing" as soon as they were launched. I am super excited about the new matte colors they are about to offer too. I am not a gloss girl but I like pigmented liquid lipsticks which are not super glossy. Estée Lauder Pure Color Envy Liquid Lip Potions seem to fit the bill, so here are my thoughts about it and the new Lip Volumizer. Estée Lauder Pure Color Envy Liquid Lip Potion and Lip Volumizer come in deep blue packaging and have a similar shape to Envy Sculpting Lipstick cases. Liquid Lip Potion has a stipe on one end which shows the color. Very good feature if you are rushing in the morning and you have multiple of those. Lip Volumizer on the other hand has a fully opaque case. The sponge tipped applicator is perfectly shaped, not too big nor too small, very comfortable to apply the lipstick on the corners. With this one I don't feel the need of an additional lip brush to correct the edges. 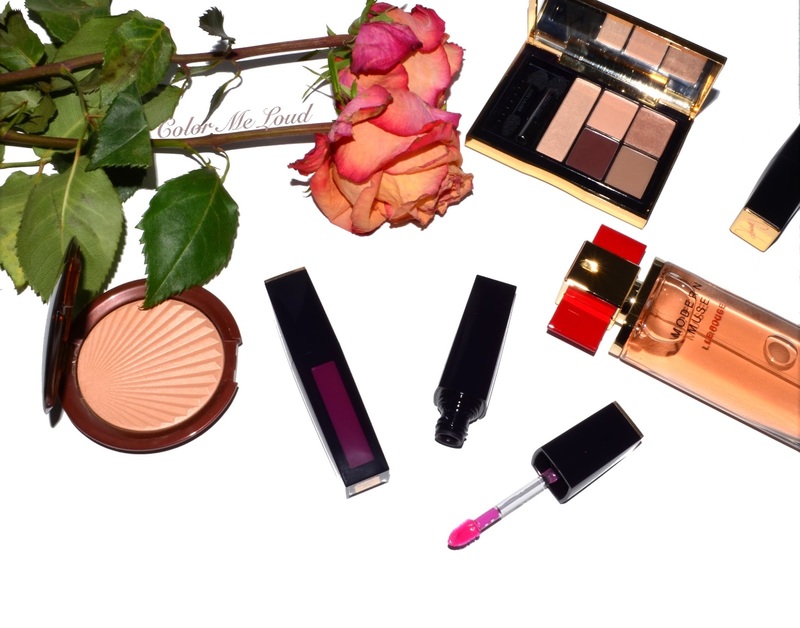 As a comparison, I find it easier to use than By Terry Velvet Rouge (reviewed here). Estée Lauder Pure Color Envy Liquid Lip Potion 430 True Liar is a lovely berry shade for Fall, which leans a little more purple than red. Once compared to By Terry Velvet Rouge, is it more purple and not so insanely pigmented. That said True Liar has a good deal of pigment and lasts long on the lips. I think the pigment degree of True Liar is just right, a little bit more, it gets harder to control. This formula doesn't set entirely and gives a nice moisturizing feel on the lips. The downside of such a nice formula though is that it may migrate to teeth and around if you are touching around the mouth or eating/drinking something. I have a few FOTDs with lipstick all around my teeth, well, it happens. I found it most comfortable if I apply the tiniest bit and use it between a stain and a lipstick. This way it lasts long and is easier to maintain. You have seen me wearing it here (check out for more details on the makeup), here is another photo from the same day. 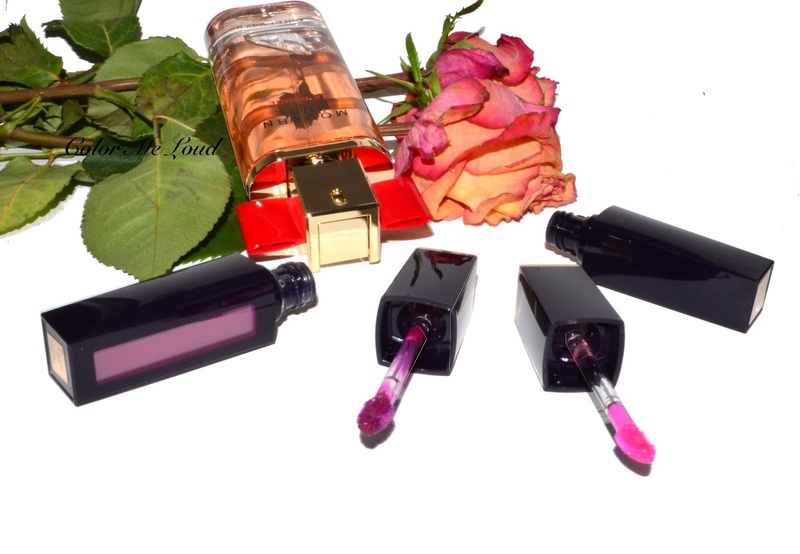 Estée Lauder Pure Color Envy Lip Volumizer is a mostly clear gloss with a hint of pink. Once applied on the lips, it gives a refreshing effect (like mint) and a slightly tingling sensation. After a few minutes it stimulate the lips to make them look fuller. It can be worn under the lipsticks or on its own. It can also be worn over the lipstick but then it can't stimulate them so much but instead makes them appear fuller by its glossy finish. Below I am wearing it on its own. Thumbs up for Lip Volumizer because my lips are very sensitive. Previously I had to toss various similar products because they were burning a bit too much for my liking. You have seen this look on me previously here with the full list of products, here is another angle. Estée Lauder range started to get some beautiful packaging, don't you think so? I like the gold blue package and the combination with red very much. Waiting eagerly for the matte lippies, who is with me? I am hearing that they are already out in the States. Have you tried them yet? 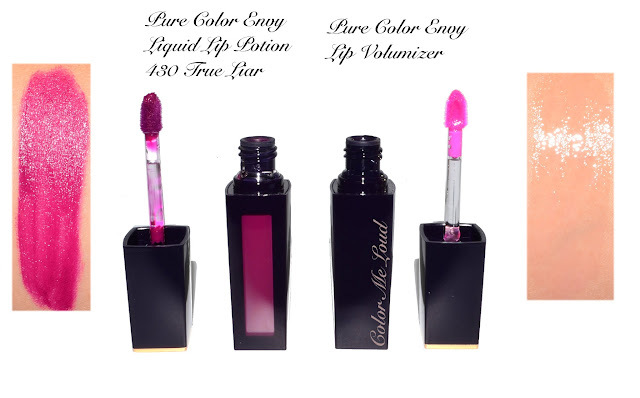 Final thoughts: Estée Lauder Pure Color Envy Liquid Lip Potion packs a good deal of pigment and it is easy to apply it with its very comfortable applicator. I learned though with these less is more, so ended up packing a bit too much and got purple teeth. I found out they work best in tiny amounts. My sensitive lips didn't get offended by the Lip Volumizer and I like its slight rosy tint, so loving it at the moment alone and under my lips. By the way I am a Youtube Noob. Seriously the only channel I was religiously watching is Lisa Eldridge's. I went ahead and checked out Huda Beauty a few days ago since I was in bed and very bored. This was the day I learned about (mechanical) "Lip Plumpers". OMG, it looks so painful. Almost like a medieval torture device! Have you ever used something like that?? Hey Sara, I am so bummed that True Liar migrates on you! On me it stays put with food and drinks. I have the same problem with GA Lip Maestro tho. On me it gets EVERYWHERE, but on some it wears like iron! Really interested in the Lip Volumizer. It feels like a cross between something like Dior Lip Maximizer and Lip Glow. I would have loved to see some SPF in it tho! This is such a pretty look on you, but I don't do tingly lip products! I am very very sensitive and would be worried about a full-on allergic reaction, plus the idea just doesn't attract me. As for your question, I think you do beauty very very well and love you to continue doing that, but I always love your life tidbits at the beginning and would love some fashion/fitness inbetween! Glad you're feeling better, have a great week. PS my Chanel Entrelacs has been wearing uncreased for 10 hours now and I thought I'd have to intensify it for this evening, but since I've just slapped on a bold lip (Love Liberty) it's simply enough. A bit more shine on the inner corners and I am about to split. LOL! Thank u for the review of true Liar! The mattes are already in Stockholm and all i can say is that i believe you will adore the formula perhaps more than Tom ford's! Unattainable and Stronger are included to my favorites! I can't wait to read your thoughts on them when you get them! True Liar is gorgeous on you! Too bad it's so high-maintenance. I'm not much of a YouTube watcher either. I find I get bored too easily...I just don't have the patience to watch someone talk about their makeup haul for 15 freaking minutes. Love Lisa Eldridge though. I also enjoy Nikkie Tutorials, even though I generally find her makeup is a bit over the top for me personally. True Liar looks really beautiful on you! Too bad that it won't stay in place. Do you use the thumb trick to avoid lipstick transferring on your teeth? It works well for me - but of course it can't do anything for lipstick that bleeds beyond the lip line. I don't like to watch makeup videos on Youtube, so, I don't follow anyone, not even Lisa Eldridge! I only watch videos once in a while if a blogger I follow has one embedded in their blog post. I don't know, I really prefer a written post with good pictures rather than a video! You could blog about your hangnail and I would still read your posts :) So yes to the fitness posts and anything else you want to write about. Your blog--your rules. On to more pressing business--True Liar looks downright stunning on you. Truth be told, I have passed by these countless times and I found them to be quite similar to Shiseido Lacquer Rouge (which I have 8 tubes). Now that lip plumper is something I have not seen. The Matte lipsticks are lovely, but again, not exactly what I'm looking for at the moment. I just ordered Lancome's L'ABSOLU VELOURS and those have an amazing texture and feel. I agree with you about Youtube--Lisa E. has been consistently classy and informative, where all others and just trying too hard to get noticed. Oh Sara, this was the shade I really wanted, but it wasn't available for me to choose! Sorry to hear it migrated onto your teeth, 1 of my blogger friends also had the same experience... including feathering at the edges! :( But that Lip Volumnizer is marvellous isn't it? I too hate stinging lip plumper! I agree, the lip volumizer is very pleasant to wear, doesn't sting at all! Actually, for me it doesn't even tingle. I feel nothing. I'm all sleepy right now and forgot to tell you look like a dream on both pics! true liar really suits you! Also, True Liar looks amazing on you! It's not available in Asia, so there's that. I love the formula, but have to agree that they migrate. So when I drink, I use straw. I haven't tried both of these you mentioned. I have tried one product which was supposed to tingle from Rouge Bunny Rouge range and I thought I was loosing my lips. It hurt that much, Needless to say I am not wearing it again. This is why I was a bit cautious but it worked haha. Oh it is great to hear that you like Entralacs. It didn't crease on me either. I mean, I don't know because it is so soft, hard to see the powder on the eyelids haha. *takes notes* Unattainable and Stronger! Yes I want them too!! the same here, I sometimes start watching then I get bored and change and get bored again. Gosh people do have time! 15 minutes one video, 4 of them make an hour. I simply don't have this sort of time to spend. Nikki is really cute but as you pointed out, it is a bit too much for me. Still one can get some tips from her. Thanks for writing your opinions. I am posting here to get in touch with lovely readers as yourself. I wouldn't like to change my audience. 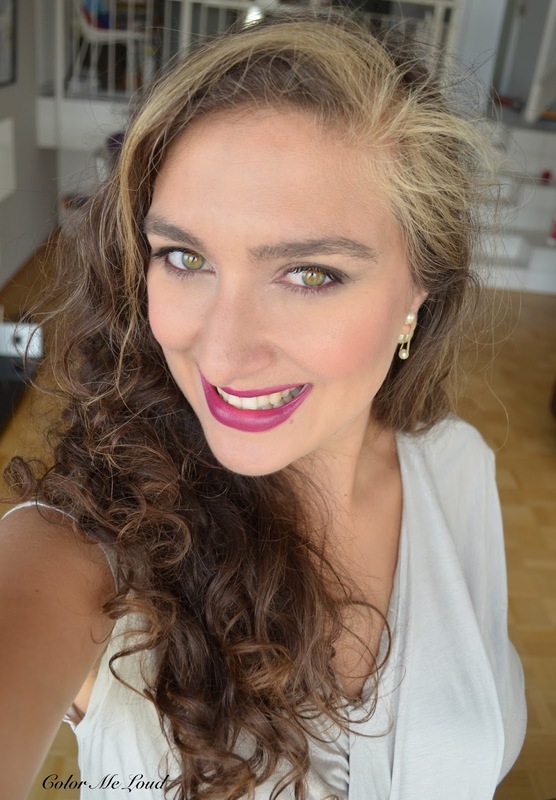 I am just considering to extend a little, like showing the FOTD and showing the clothes which matches the makeup. Thanks, very kind of you to say that. I have heard that in Asia True Liar is not available? Let me know if you want me to get it for you. Or you might check it out in Italy too of course lol. I know, it is so personal, this one migrates to my nose even. I met a few friends last monday and they were like "watch out there is something purple on your nose" ugh oh! I have very sensitive lips, so on me the others are not bearable. This one is just fine lol. Not only teeth but nose etc. LOL, it is everywhere! too bad it is not available there, if you want it let me know. With this one if I eat and drink I get it everywhere around my face lol. Straw is a good idea! LOL you cracked me up! Fortunate enough I don't have anything to say about the hangnails! I found that writing a blog about something gets me in shape, like provides motivation to share things so blog might be a positive thing for loosing some pounds I gained during the last three years. They won't take over the blog but just come as an extension. Too bad that I haven't tried Shiseido Lacquer Rouge. It seems like you love them, I should check them out too! Oh that trying hard to be noticed. *sigh* I have just seen Lisa E.'s no mirror lipstick challenge and I was like "Lisa, you really don't need it!" but it seems Youtubers want it. There are channels who have more subscribers than hers and they hardly know how to apply makeup. Oh thumb technique? I need to try! Thanks so much for the advice. These don't bleed beyond the lip line, they apply beautifully but after the application they get everywhere, teeth nose, cheeks you name it lol. I am with you, I like a post which is more efficient, nice photos which come with google search too so that I can always refer to the swatches. And I would definitely read those things! I actually really like seeing makeup and nail polish in the context of a full outfit. I was referring more to when a blog veers really far off course without actually rebranding. There's a food blogger I used to read who constantly does fashion posts now and almost never posts recipes anymore. That's when I start to drift away.